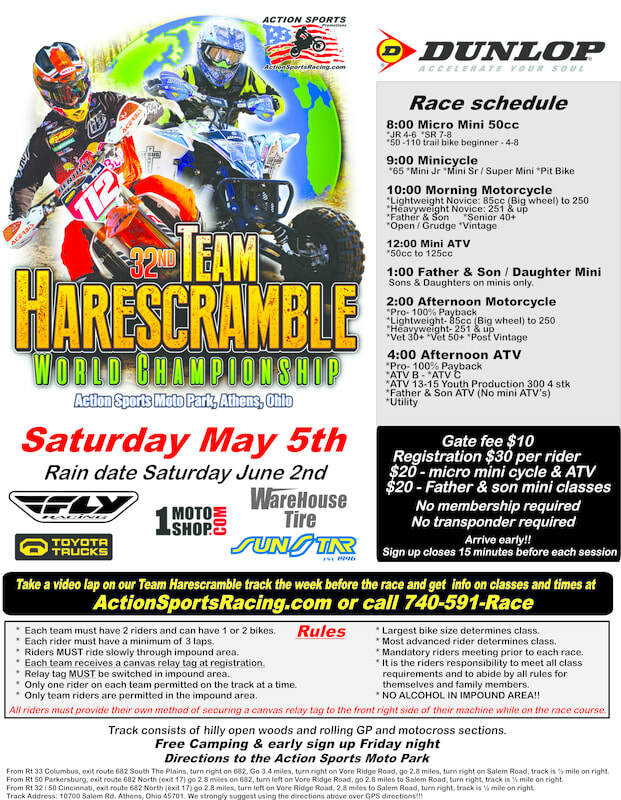 The 32nd Team Harescramble Championship of the World will take place in the Spring of 2018 at the Action Sports Moto Park 10700 Salem Rd in Athens, Ohio. Come and see what fun four to five hundred riders have every year. Known as the most fun on wheels the Team Harescramble Championship of the World began in 1984 and has grown to be the largest event of its kind and one of Ohio's largest harescramble events as over 200 teams compete throughout the weekend. Over the years participating riders have included former National Enduro Champions Jeff Russell and Terry Cunningham, GNCC Champions Scott Plessinger and Scott Summers, along with Robbie Jenks, Charlie Mullins, Cory Buttrick, and many others. It is a favorite among the mini, amateur and ATV riders as well. The 5 mile course combines fun and easy open woods along with Grand Prix and motocross sections with no whoops or double jumps. It is designed to be fun for riders of all skill levels. It has great dirt, a great deal of elevation changes, but still no radical hills. It's a fantastic place to watch and even more fun to ride. There is plenty of flat parking for RV's and campers and overnight camping is free. Admission is only $10.00. Father and Son Mini Classes: The mini father and son cycle class was created at the parents' request. This class runs separately and takes place on the easiest course possible, so all riders of any skill level can complete the course. Kids can compete on any size mini bike 50-105cc, and the parents can compete on any full size motorcycle. ALL competitors that race in this father and son class must realize that this is a fun event and there will be adults on full size motorcycles on the track at the same time as their kids on mini bikes. Therefore extreme caution and courtesy must be used at all times. We have held the father and son mini cycle race for years with great success.